Are you looking to hire charter bus rental Lutz to attend a wedding as a group? Do you want to hire a reliable 40 passenger charter buses to visit a city nearby for an event? Whatever is your need to hire charter buses, you can rely on us to get the best services day in and day out. Reserve a charter bus now, call 813-514-6980. It is not a matter for us whether you want to hire 20 passenger mini buses to enjoy a fun night in the town or take a trip to a nearby city for a family reunion. We offer you the charter buses to suit your needs and budget. All modern day amenities like HD TV screens, sound system, Blu-ray player, disco lights, carpeted flooring, posh leather interiors, etc., are in place in all our charter buses. You just need to call us to get to know the details of the 30 passenger shuttle buses that you would like to hire. You can even request for a quote for the same through our website and we promise to reply as soon as possible with the best price for your transportation needs. We guarantee that you will enjoy the best services when you opt for charter bus rental from us. If you are transporting a group of people for a wedding or birthday, you can try our party bus rental service in Lutz. 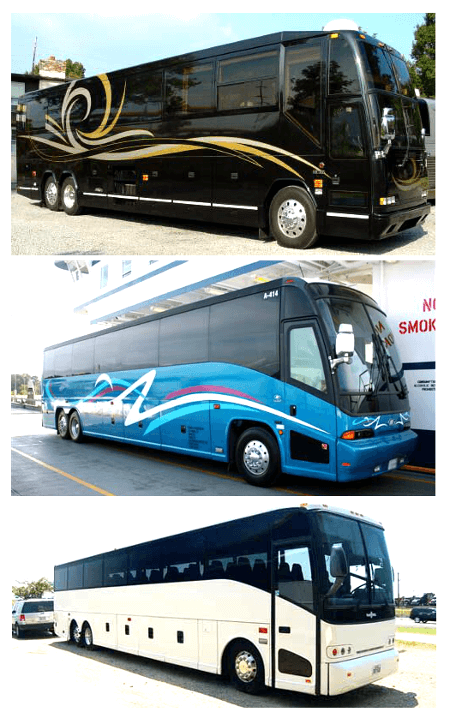 Hire our charter buses to enjoy the best luxury transportation. We have well trained chauffeurs and staff to provide you with assistance whenever you need our help. We have a wide variety of fleet to meet the travel and occasion needs of our customers. You will be coming back for more once you opt for charter bus rental service from us. Call us now to get today’s best pricing: 813-514-6980. Heritage Harbor Golf Course; if your group loves golfing, then hire our charter bus Lutz and visit this lush green course and surrounding greenery. Tampa Premium Outlets; a great place to shop for all kinds of stuff and to empty your pockets. Friendly Farm Park; a great farm park to spend a day with your family or group. Art Bar; put your creativity into task in this bar that will be enjoyed by your kids. Booker Creeker Headwaters Nature Preserve; a great natural trail to enjoy a day. If you are looking for the best and affordable charter bus rental for airport transport, then check out our specialized services on offer. Our chauffeurs are trained to take you to and from the nearest Tampa international airport or St. Petersburg-Clearwater International airport on time and hassle free. We also have your standard stretch limousines for rent in Lutz, available for airport transportation. Traveling in and around Lutz is affordable if you hire any of our charter bus services. Some of the nearby cities that we cover are: Orlando, Tampa, Saint Petersburg, Jacksonville, Holiday, Elfers, Safety Harbor, Citrus Park, Zephyrhills and Oldsmar.